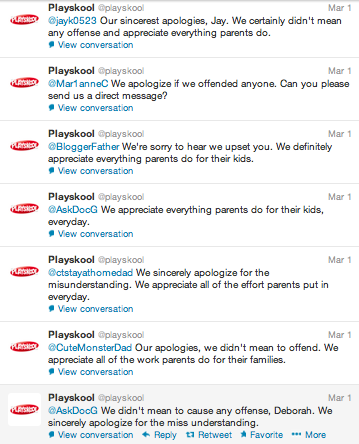 Playskool found itself in hot water after the brand Tweeted a question that many dad bloggers found offensive. As you can imagine, this sent dads into an uproar. The response indicates a move of dad become more vocal in social media and especially as bloggers. Yet, the dad bloggers are the ones taking brands to task each day, making sure that a question like Playskool’s doesn’t go unnoticed. Before the first Dad 2.0 conference, they famously called out Huggies for launching an ad campaign based on stereotypical “bumbling dad” stereotypes, which resulted in commercials being pulled. And representatives from Kimberly Clarke, who owns Huggies, flew to Austin, Texas where the conference was held to apologize. Meanwhile, some parents said they plan to stop buying Playskool products because of this comment. Since the unfortunate Tweet on Friday, Playskool has been personally apologizing to bloggers and Twitterers the point of making their Twitter feed one big mess of sorry. “Our intent was that kids sometimes take over the household,” Playskool told Scout Masterson, a gay dad, who gained a following after appearing on “Tori and Dean.” Father of two, Chris, who blogs at CanadianDad.com, pointed out that they are usually pro-dad in their communications, and linked to this sweet image the brand posted on Facebook the day before their Twitter debacle. This certainly raises the question of clarity of humor in social media. While it is important for brands to have a sense of humor about themselves, their products and the situations their customers often find themselves in, one must also consider the context of social content and how it could be interpreted.